Way back in the early 2000s I did a bunch of shows with Steve Murray of ModernGreen and we have been friends since. ModernGreen is an uber cool Dublin City based agency, as well as creating experential events and media they also handle a bunch of artists. Working currently on pieces with MG now including an upcoming collab with the artist Maser. Maser is a sick sick visual artist predominantly knocking out street art in Europe and the States recently. On 11th November MG did their annual gathering and talks in which they got folk like Maser, Aaron Heffernan and Barry Keoghan from the show Love/Hate , Chris Chapman, JB the Deejay and myself to give talks. 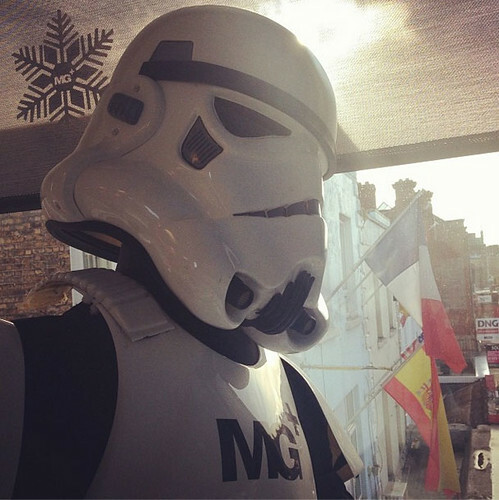 You might have seen a bunch of shots from MG base in my recent star wars obssessed instagram feed.